NETWORK FINALS: There were no changes from Wednesday’s preliminary ratings. CABLE HIGHLIGHTS: ESPN’s NBA doubleheader was at 0.59/0.53. Bravo’s REAL HOUSEWIVES OF NEW JERSEY rose 0.06 to 0.48. On VH1, BLACK INK CREW dipped 0.04 to 0.41, and LOVE & HIP-HOP was down a tick to 0.38. On History, VIKINGS ticked down to 0.39, and the lead-out premiere of KNIGHT FIGHT was at 0.19. 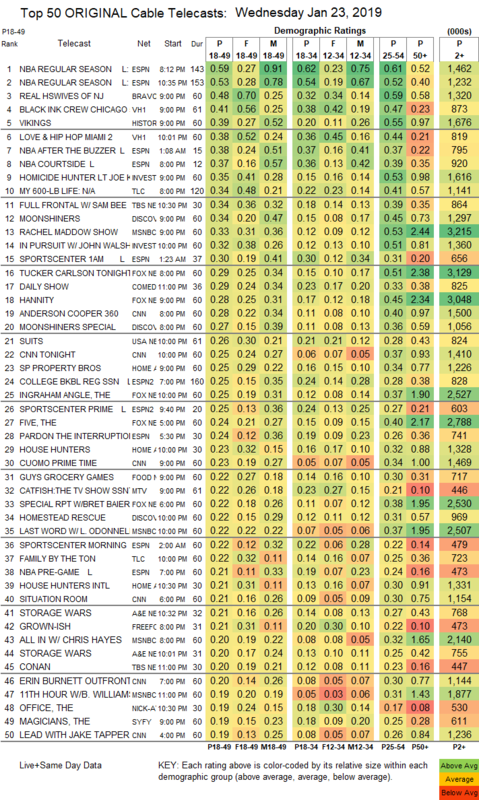 On ID, HOMICIDE HUNTER was at 0.35 compared to last week’s 0.29/0.29, and IN PURSUIT was down 0.03 to 0.32. On TLC, MY 600-LB LIFE lost 0.05 to 0.34, and FAMILY BY THE TON was down 0.02 to 0.22. TBS’s FULL FRONTAL returned at 0.34. 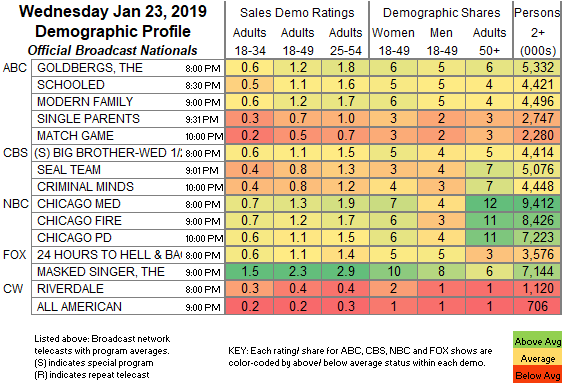 On Discovery, MOONSHINERS slipped 0.03 to 0.34, with a lead-in special up 0.02 to 0.27, and HOMESTEAD RESCUE was down 0.05 to 0.22. MSNBC’s RACHEL MADDOW SHOW led cable news at 0.33/0.53/3.2M, with Fox News’s TUCKER CARLSON TONIGHT at 0.29/0.51/3.1M, and CNN’s ANDERSON COOPER 360 at 0.28/0.40/1.5M. Comedy Central’s THE DAILY SHOW made it into the night’s Top 20 at 0.29. USA’s SUITS resumed its season at 0.26, down from last March’s 0.30 premiere and last summer’s 0.28. On HGTV, PROPERTY BROTHERS ticked down to 0.25, HOUSE HUNTERS dropped 0.05 to 0.23, and HOUSE HUNTERS INTL was down 0.04 to 0.21. Food Network’s GUY’S GROCERY GAMES fell a tenth to 0.22. MTV’s CATFISH shrank by 0.04 to 0.22, and TRUE LIFE NOW was steady at 0.13. A&E’s STORAGE WARS was at 0.21/0.20. Freeform’s GROWN-ISH fell 0.06 to 0.21. On Syfy, the season premiere of THE MAGICIANS was at 0.19, down 0.11 from last season’s premiere (it’s already renewed for next season), and DEADLY CLASS fell a heavy 0.09 from last week’s premiere to 0.13. E!’s BOTCHED ticked up to 0.19. On TNT, DROP THE MIC was at 0.16, and THE JOKER’S WILD was at 0.12. On Lifetime, PROJECT RUNWAY ALL-STARS ticked down to 0.15, and AMERICAN BEAUTY STAR ticked down to 0.08. FXX’s YOU’RE THE WORST ticked up to 0.08. Tru’s I’M SORRY was down 0.02 to 0.07. WGN’s PURE debuted at 0.07. Pop’s SCHITT’S CREEK held at 0.05.